During a recent broadcast, game publisher Bandai Namco Entertainment announced the update schedule for upcoming action RPG sequel God Eater 3 from 1.20 to 1.40. Addition of “Class Certification Missions” as new challenge content. Essentially rank-based missions, the difficulty will gradually increase as new missions are unlocked. 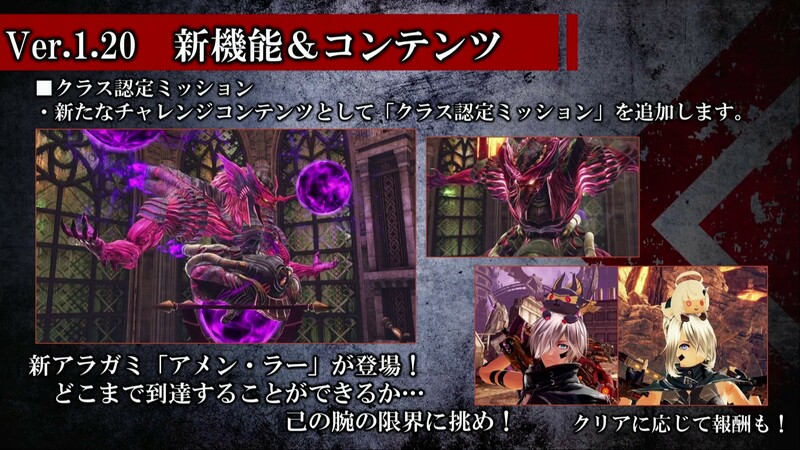 A new Aragami named Amen Rah will also appear. Clearing these missions will earn players rewards. Addition of skin color change feature to the costume equipment screen. Addition of password setting feature to Assault Missions. New NPC costumes added. Some costumes have separate tops and bottoms. Color variations are also being prepared. New hairstyles added. There are more than just the ones pictured. New accessories added, which can be obtained as rewards for clearing Class Certification Missions. Adjusted Havakiri’s motions and AI. Adjusted the HP of Neva’s body parts. Adjusted the frequency of Ashland Aragami devour attacks. Reduced the charge time for every devour action, and increased the pre-activation and post-devour motion speed. Increased the motion speed of armor deployment when guarding. Added ability to change guard direction during jump guards. Adjusted the activation conditions for some Accelerator Triggers. Advanced Guard added to Buster Blade. Advanced Step and Advanced Jump added to Short Blade. Reduced post-fire cancellation timing for the Long Blade’s Impulse Edge. Increased the activation motion speed for the Long Blade’s Zero Stance. Reduced the Charge Spear’s charge completion time. Extended button time window for the Variant Scythe’s “Hell or Heaven” Burst Art. Adjusted the Link Burst Bullet so that it does not disappear if it touches the field. Adjusted the recovery attribute Module so that it does not disappear if it touches the field. Adjusted the speed of the “starting to walk” and “starting to run” motions at the base. Additional Story Missions – Adds story missions that depict the story after the game’s ending. Additional Companion NPCs – Adds Keith and Neil as new companion NPCs. Time Attack Missions (title tentative) – Adds “Time Attack Missions” (title tentative) as new side game content. Other plans are also in progress. God Eater 3 was already launched in Japan last year on Dec. 13. The western version will be launched on Feb. 4 worldwide. It will be available on PlayStation 4 and PC.